Advanced StartUp Manager 2.0 free download. Advanced StartUp Manager is a program that will allow you to control what programs run at system startup when you turn on or logon to your computer. It supports Registry, StartUp folders in the Start menu and Win.ini file. Advanced StartUp Manager helps you handle problems with programs that are automatically launched at startup by listing them and letting you disable, enable, delete them and so on. You can save the list of programs that are currently enabled or disabled as a profile that can be restored at a later time. This option is useful when you want to test several startup configurations. StartUp Juggler will help you manage problems occured with programs that are automatically launched at startup by listing them and letting you disable, enable, or delete them. 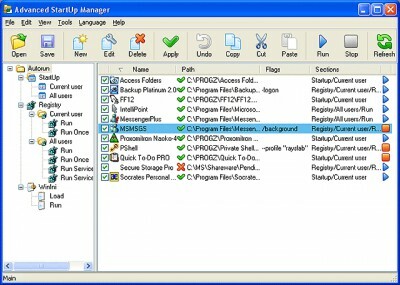 Startup Genie is a handy software utility that allows you to control what programs run at system startup when you turn on or logon to your computer. Startup Cleaner and Autorun Manager - There are certain programs that you want to execute when your system starts. There are certain programs that you want to execute when your system starts.